Letters to Ian: Easter Eggstravaganza! Keeping with our game of catch-up, it's time to write about another adventure from March: Easter! This year Easter kind of sneaked up on us. It was the weekend following our cruise, which made the end of March a very busy time. We just barely decorated the house in time! But we did, and Easter was another fun time we all shared. Since all of our family lives in Tallahassee, we usually get to have more than one holiday celebration for each special day. This year, we celebrated Easter on Saturday with Grandma and Grandpa Brooks and Uncle Kurt and Aunt Stacey on Saturday, and then on Sunday, we celebrated with Grandma and Papa Davis, Uncle Gary, Aunt Megan, Payton and Taylor. It made for an exciting weekend! (yummo) and an Easter egg hunt. Grandma and Grandpa hid eggs all over the house, and you and Abigail had a blast looking for them. 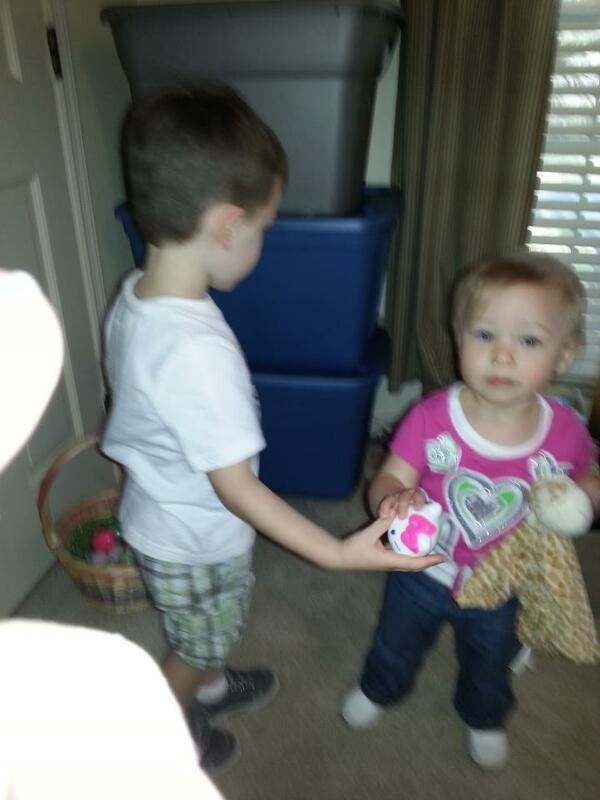 You were even so helpful to your cousin and showed her a couple of eggs that were hidden in funny places. Then we all opened Easter baskets, and boy are you a lucky kid. Grandma and Grandpa filled a basket for you, and so did Uncle Kurt and Aunt Stacey. You received all kinds of nice treats including books and bubbles and, of course, Easter goodies. 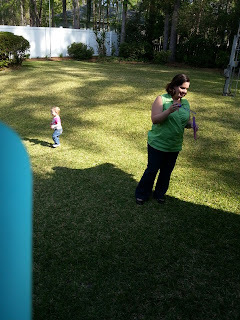 Then we spent some time outside blowing and chasing bubbles. It was a really nice morning, and a great way to kick off our Easter festivities. 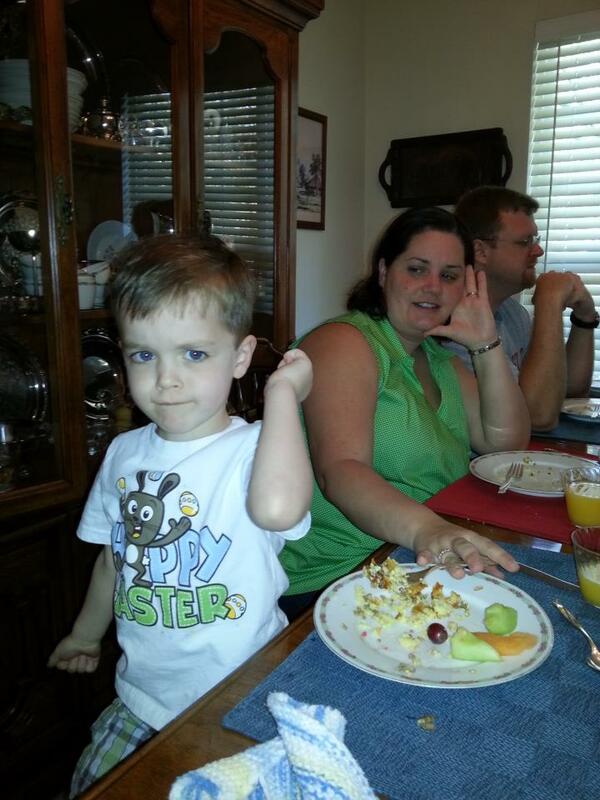 You showing off your muscles at breakfast. Mommy having fun blowing bubbles. Our eggs. Two of them went to school for dyeing in Science. cool trick last year where you use a wire whisk to dye the eggs (you squeeze the egg between the wires, and it holds the egg just perfectly, unlike that little wire holder in the Paas kits), so we broke those out again and we got to work. We all got in on the dyeing action, even Daddy, and we ended up with some really pretty Easter eggs. Daddy's eggs are the really fancy striped ones in the package. 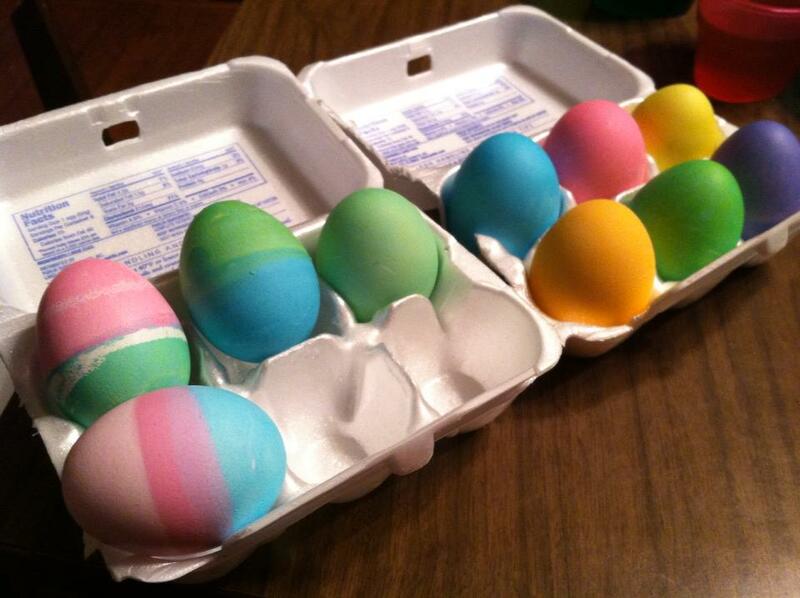 He had to get all spiffy with his egg dyeing. And it's a good thing that Mommy likes hard-boiled eggs. You don't like them, so I got the pleasure of making sure that all of them were eaten. Anyhoo. The next morning was Easter Sunday. You woke up early and came downstairs to find your Easter basket (bucket) on the dining room table filled with goodies. I think you were really excited about it There was more bubbles, candy filled eggs, Peeps, a ducky nail brush, bubble bath and a chocolate bunny. It being a special holiday and all, you got to eat a piece before breakfast. Lucky boy. After a good breakfast, it was time for church. You, Daddy, Grandma Davis and I all went to Easter Mass. Usually we go to St. Thomas More for church, but this year we went to Good Shepherd. You were so well behaved in church. 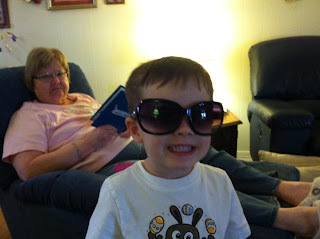 I took a couple of books for you, and you took turns sitting next to me, then Daddy then Grandma and then back to me. When we went up for communion, you held my hand like a big kid, but then when we got back to our pew, you did ask for a "cookie" like the one I received. We had to have a talk to work that one out. Mommy was smart and brought you a few jelly beans though. 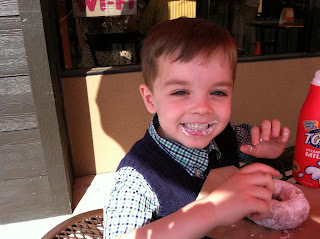 After church, the four of us had a special treat: Donuts! One of my memories of church was going off to Sunday School and the Grandma Davis (my Mommy) bringing us donuts or bagels which we ate in the car before Mass. We all had a nice treat and then we went home for you to take a nap before going out to the farm for Easter dinner and an egg hunt with your cousins. So from here on out, I'm just going to post photos of our Easter Sunday on the farm. It was a great holiday weekend, and we are so lucky to have all of our family close so we can do all of these fun family things. I love knowing that you are growing up side by side with cousins, Aunts, Uncles and grandparents. It makes my heart smile.